Old, rustic charm with specially imported Italian bricks filled the air as I stepped into the newly relocated Ristorante Da Valentino at Turf City Singapore. Spanning across 10,000 sq ft, the Italian charm can now house up to 100 people with an Indoor Bar/Lounge & an Alfresco Drinking Bar. 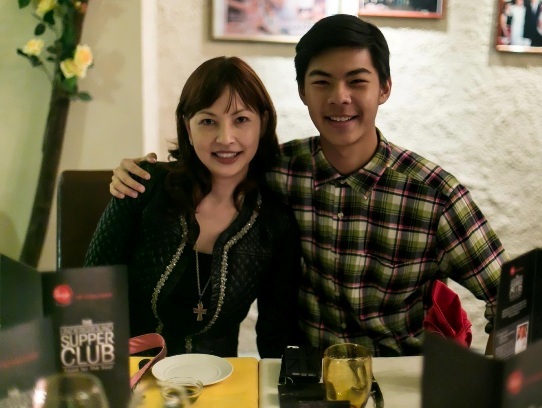 Thanks to DBS Indulge & Asian Food Channel, I've got to taste authentic Italian creations at Valentino, hailed as one of the top Italian restaurants in Singapore! Although the rain was pouring with deep rumbling from the sky that stormy evening, it did not deter the hungry guests from finding their way to the eatery. Here's presenting The Underground SupperClub by DBS Indulge, as we discover how renowned Chefs re-define “Food For The Soul” in this after-hours special, where we get to dine, mingle & exchange conversations with Chefs & like-minded food lovers. The intriguing part of the SupperClub is that diners do not get a hint of what's serving ahead. The secret themed menu will only be revealed at the venue, as tasty treats awaits us at the dining table. 30-mth Parmiggiano Reggiano Cheese & other appetizers were served as the guests mingled with one another, sipping a glass of Zardetto Prosecco Zita Dry 2011. Dinners soon kicked off with a trio of appetizers. Making its way first were the Bormio Salad & Pan-fried Tomato Cheese wrapped with Parma Ham. The uplifting salad was filled with apples, bits of onions, olives, nuts & topped with Ricotta. The Pan-fried Tomato Cheese was a real teaser, with the cheese oozing out of the Parma Ham when cut. It was yummy, though the ham can be a bit on the salty side for some. The starter was paired with Jermann Oinot Grigio 2011; intense flavours & aromas of orange blossoms, honey with apricot, apple & spice on the rich, full palate. The Gamberi Rossi was my favourite dish for the evening. The Italian Red Prawn was so tasty that I'd polished up the entire shellfish, sparing no effort to leave a trace of the mouth-watering roe. The prawn was simply baked & served with its roe, highlighting its natural flavours. Even the freshly important Italian grass was delicious. The watercress salad was so fresh & crunchy; I'd gobbled them all in seconds! I smacked my lips & smiled with content as I slurped the twin pastas as though I was famished. The Duo of Linguini Crabmeat Aglio Olio & Squid Ink Fettucine Crabmeat in Creamy Tomato Sauce was a winner, working together to build a marvellous sense of harmony! Wine pairing: Roccolo Grassi Valpolicella 2008; a rich, fresh, fat, full-bodied wine with sweet tannin & a long finish. I'm not a fan of Beef Cheeks; the dish is too commercialized. Everywhere I go, restaurants these days are always serving Beef Cheeks as one of their highlights. I'm quite sick of the dish frankly, so it's not fair for me to comment. I'm gonna skip to desserts! Desserts are ladies' favourite; we always have room for that. The duo of Tiramisu & Panna Cottawith Pistachio was paired with Felsina Vin Santo 2001. With scents of peach, apricot, ripe pineapple, the palate demonstrates velvety smoothness, elegant fruit nicely married to the oak. Oh, I don't always talk about restrooms...... but Valentino's washroom is just too charming & it's so spacious! So if you need a break during your meals, you'll know where to head to. Just make sure you don't fall asleep in their comfy sofas! Ristorante Da Valentino is a great place for an intimate meal for two or a corporate function, as their private dining room can cater for groups of up to 45 people. The room can be further divided into three private rooms to accommodate 10 to 16 people. Chef Valentino takes pride in serving authentic food from his hometown, Milan, & believes strongly in serving authentic Italian food. He would go back to Italy every year not only to remain connected with authentic Italian food, but also to source for interesting raw materials and create new dishes for his customers. So if you're looking for some real yummy Italian food or a place to chill out with friends, here's a place you wouldn't wanna miss! Keen in joining & meeting people of similar interest? Enjoy taking shots of mouth-watering creations by Chefs? Be sure to look out for the next Underground SupperClub! Thanks to the two pretty ladies, Clara & Faith, for organizing this fab event! 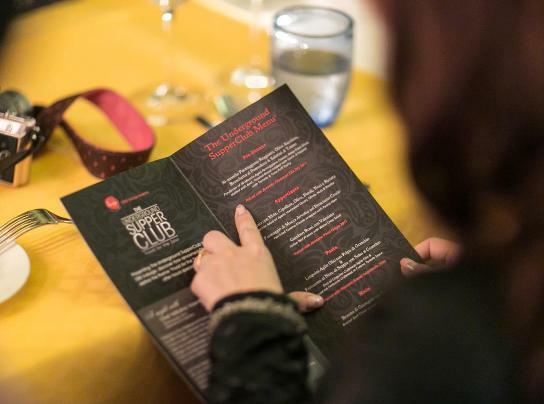 The Underground SupperClub is jointly organised by DBS Bank Ltd & the Asian Food Channel; an exclusive event for DBS/POSB Credit and Debit Cardmembers. 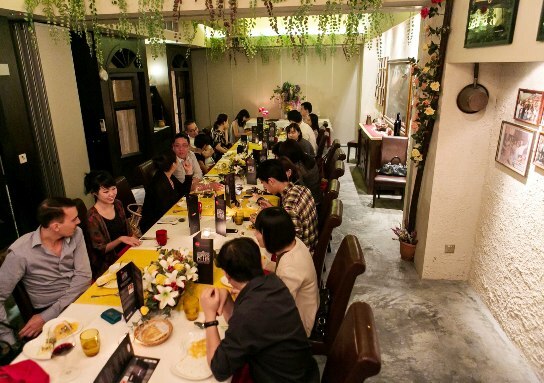 S$100 nett per pax (for DBS / POSB Card members only without wine pairings). S$150 nett per pax (for DBS / POSB Card members only with wine pairings). Welcome back! Turf club road in my impression is a dead town to me. Never know that there's such a nice restaurant in there. I guessed you must have had your full after the initial bake prawn with roe and ink squid pasta and that's why you didn't think much of the beef cheek. LOL! Thanks for sharing your excellent pictures. Amelia, do kiv the place so u'll know where to head to the next time u're in S'pore! U have a good week too, dear! I love the idea of a Supper Club :) And your jacket is gorgeous!!! Lizzy, makes me hungry now. Hahaha! Oh, it's from Zara, a Spanish brand! Is that really a restroom? haha looks like some places to chill out though..That Gamberi Rossi looks so yummy!! Evelyn, u're impressed too? Hahaha! We can chit chat inside there lah. I like that line, "food for the soul." Raksha, thks for your lovely note! Aki, hahaha! Good to hear from u, dear! 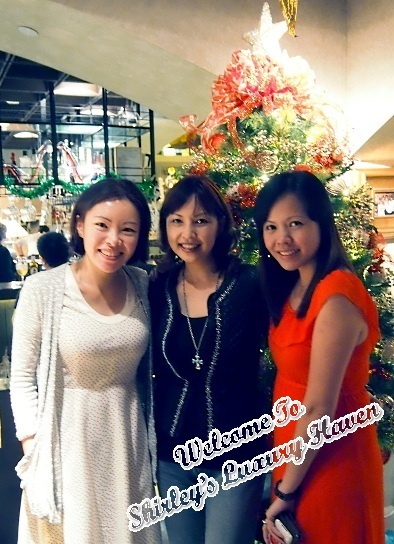 Aemy, start saving so u can feast there when u visit S'pore next time :) Happy holidays, sweetie! Pepper, gotta make advance booking if u wanna eat there; seems very popular!